The social media behemoth Facebook is bringing its engineering might to the K-12 arena by teaming up with a charter school network to refine a technology-based system for customizing lessons to individual student needs. Last year, 2,000 students and 100 teachers in Summit schools were using the tool. But Facebook and Summit officials say their ambitions for the platform in K-12 districts do not end there. This year, Facebook will support Summit’s efforts to partner with other public schools around the country that want to expand their personalized learning efforts, in what the company describes as a small pilot program. From the feedback it receives on the pilot, the company will work with Summit officials to refine the Personalized Learning Plan and eventually offer it for free to any school in the United States, Facebook Chief Product Officer Chris Cox said in a statement on the company’s website. In describing the new venture, Cox said Facebook officials had been impressed with the Summit Public Schools’ academic performance and experimentation with personalized learning for years. In particular, he cited the charter network’s use of teacher-created materials and its avoidance of lecture-based instruction, its efforts to have students establish plans for exploring their long-term academic goals and interests, and the use of techology to monitor and improve student performance. Facebook assigned a small team of engineers to help Summit officials improve its personalized-learning system. Summit’s Personalized Learning Plan is operating as a “completely separate” entity from Facebook and will not require users to have an account through the social-media platform, Cox said. Facebook, which went public with much hoopla in 2012, has 1.4 billion monthly active users, and yearly revenues of about $12 billion. The announcement will surely usher in speculation about the potential business implications for Facebook, and whether it has broader ambitions for working in the notoriously hard-to-crack K-12 market. It’s possible that Facebook’s work on the school-technology project—especially if its reach expands to other schools around the country—will increase confidence in the company’s ability to fashion technology to meet K-12 districts’ specific, and often highly complicated, needs. In theory, Facebook’s work with Summit could smooth the path for the company to bring other digitial tools and systems into the school market. 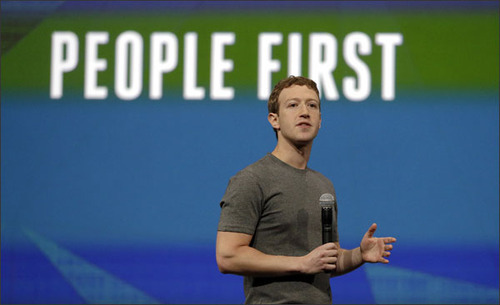 Facebook’s co-founder and chief executive, Mark Zuckerberg, has sought to put his stamp on education issues in the past. Five years ago, he announced plans to funnel $100 million of his money into transforming the long-troubled Newark, N.J., school system. Zuckerberg said at the time that he envisioned taking steps in Newark that included making broad academic improvements, closing failing schools, and investing in charter schools. In the years since, efforts to refashion the city’s schools have come under heavy criticism from those who say the plans put forward by Zuckerberg and New Jersey policymakers have fallen well short of their lofty goals. Diane Tavenner, the founder and CEO of Summit Public Schools, said the seeds of the partnership were planted during a visit by Zuckerberg to one the charter network’s campuses, in Sunnyvale, Calif.
During that visit the Facebook official was introduced to Summit’s efforts to personalize learning through technology, which had begun to outstrip the school system’s ability to carry out the work, Tavenner said in an interview. The Summit system had just one engineer on the project, she recalled. Shortly afterward, Zuckerberg arranged to assign a group of Facebook staff to help. The Summit schools have raised money from private sources to support the creation of the personalized-learning system, and it is ready to do more to cover the costs of expanding it so that other schools can use it, Tavenner said. Facebook’s investment of its engineers’ time in the project has been substantial, she added. In announcing the new venture, Cox said that everyone working on the project with the Summit schools will follow privacy guidelines to protect student data. The Facebook official said that Summit adheres to the Student Privacy Pledge, which means that Facebook employees working on the project will be required to follow its principles when handling Summit students’ data. The Student Privacy Pledge is an effort led by the Future of Privacy Forum, a privacy-advocacy group; and the Software & Information Industry Association, an industry group, in which companies agree to protect and not sell students’ personal information and not direct advertising at them based on user profiles, among others guarantees. Bill Fitzgerald, the director of the privacy initiative at Common Sense Media, a San Francisco-based nonprofit that has advocated for strong privacy protections, argued that Summit’s allegiance to the pledge—the charter network has signed it—does not mean much, on its own. The real test will be the terms under which data are collected and used, and what kinds of judgments are made within the system by those who design it for personalization and “algorithmically-mediated learning,” Fitzgerald said. That information may not be known for some time, he said. Typically in personalized learning, learners interact with the technology; they get a series of options, based on that interaction; and the system makes judgements, based on students’ behavior in the system, Fitzgerald noted. Fitzgerald also disputed the notion that the partnership with Summit marks a departure for Facebook by taking the company into the K-12 world. Many school groups and parent-teacher associations already rely on communications through Facebook, giving the company a potentially significant avenue for advertising to them. Tavenner said Summit will control the new personalized learning platform. Other schools’ relationship with the system will be run through Summit, not Facebook. The company will not have a vehicle for profiting through advertising within the system, she said. Ultimately, Facebook’s role will be that of a vendor, and Summit will be the entity accountable for privacy safeguards, and for the system’s overall performance, said Tavenner. She was optimistic the platform would prove popular in school districts. This post has been updated with comments from Tavenner and Fitzgerald. Photo: Facebook CEO Mark Zuckerberg delivers the keynote address at a Facebook conference in 2014 in San Francisco. God, what a stupid idea. you have multiplied the hurdles of students everywhere. ROCK! I found just the information I already searched everywhere and simply couldn’t come across.